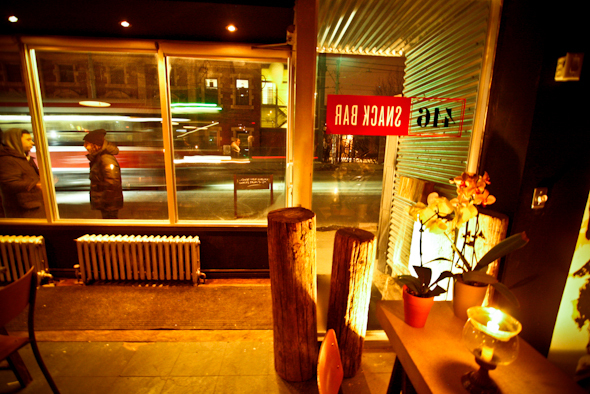 416 Snack Bar is an ode to Toronto. With a close eye for detail, owners Adrian Ravinsky and David Stewart have crafted a venue and a menu that pay tribute to the city, its neighbourhoods and its culture. The cozy gastropub is a mishmash of detail; the bar counters are striped to resemble old-school TTC streetcars, while an accent wall features a rudimentary chalk map of Toronto's downtown neighbourhoods. The draught tap is made from old telephone poles and the (tap) water is served in customized bottles. The menu is small, as are the portions. But the 416 experience is an adventure that favours novelty seekers over hungry diners. We order everything on the menu, excitedly guessing how each dish reflects a facet of the city. The "snacks" come one by one, presented with care and accompanied by an anecdote. Utensils are not part of the deal - these palate-pleasers are meant to be bite-sized. Ordered with scepticism, the hot dog ($3) gets rave reviews. The grilled sausage is smoked in-house, topped with home-made English-style mustard pickle. We are told Toronto is known for being the only city that grills its hot dogs. We ask no questions - the tiny wursts are delicious. The pork belly bun ($4) comes highly recommended and does not disappoint. The simple dish features a tender slab of pork topped with Hoisin sauce and shredded veggies, wrapped in a sticky steamed bun. The P.E.I. oysters ($7 for three) are the only menu item lacking a 416 connection, but this break in the pattern is quickly forgiven. They are plump, salty and fresh, served with Mignonette sauce and freshly grated horseradish. Other favourites include the zesty Chinatown cold roll ($3) and the crispy latkes ($6) topped with tender and smoky gravlax. Our light meal ends with an homage to Little Portugal. The custard tart ($3), with a thin layer of creamy filling in a light and flaky crust, is incredible. It's the only dessert on the menu, but no one's complaining - our mouths are full. 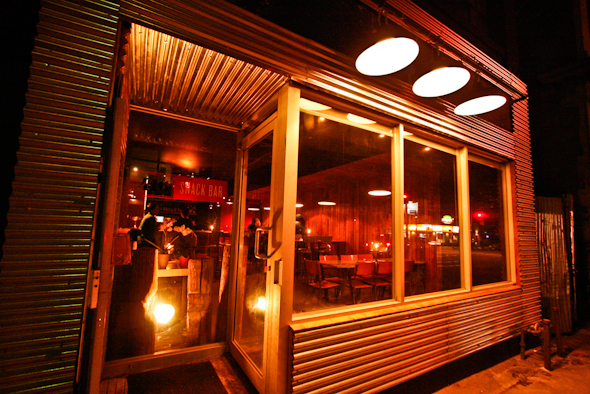 416 Snack Bar is open from 5 p.m. to 2 a.m., Monday to Saturday.